- NAV: Not too sure what this does - bearings are relative to the next waypoint in the FSX flightplan currently loaded. - A.H: Arrival Height. Not really sure what to do here - just leave it alone for a while - you can set a safety margin on your arrival height - leave it as zero for now. - W/L: Wing Loading. I know what this is but how do I find out what it "is for the day" - wing loading is your total weight divided by the wing area, and the only variable is the amount of water ballast you have on board. Just leave this alone until you've learnt a bit more about flying the glider. The default value is ok.
- HEIGHT: QFE or QNH entry for your location. Which is better and what should I do? leave this alone and always fly QNH (this means the heights are MSL which is what you want). QFE means heights heights can be adjusted to be relative to your home airfield which is no use if you fly cross-country. - INFO: Shows various information (when changed using right rotary) such as Turn/Time/etc) - When I use the right rotary it only switches between two modes though - not used in FSX. For real glider it is mainly to set fixed parameters like polar which are already programmed into the FSX C4. Now fly more, read the manual, and don't worry about the techy stuff too much. I had actually printed off the manual in August 2009 and have been reading since then (don't laugh). And yup I know the difference between QNH and QFE it's just the C4 is very new to me (having flown a Cessna FRA-Aerobat for awhile in real life). I will try more gliding obviously I just wanted to know some stuff about the C4. Also, still a bit unsure about L/D. What is the point of adjusting the right value? What is the point of adjusting the right (L/D) value? So most of the time you're flying around looking at the screen and listening to the beeps without messing with the instrument. * to your question, you might tell it "hey, I know I'm in a glider with a theoretical best glide of 43:1, but I know for a matter of fact that I haven't cleaned the wings for a year and to make things worse this is mid-Summer Louisiana and half the state bug population have committed suicide on the leading edges of my wings during the past three hours.". With dirty wings your best glide will be maybe 38:1 at best, but the C4 has no way of knowing this unless you tell it. So you give the C4 your more accurate figure for the 'best glide' (i.e. L/D) figure, and it will do a more accurate job of calculating the arrival height, which was the entire point of the process. I don't think *anyone* with a real C4 ever bothers to change this setting (ok, maybe if you had an open-class 60:1 glider) - you would just mentally add in a bit of extra safety margin into the arrival height (in your head) knowing you had crappy wings. The big selling point of the real C4 (or other flight computer) is it calculates the wind from the movement of the aircraft, and then calculates the arrival height using known but fairly complex formulas taking into account the wind, distance to go, glider performance, expected flying speed, ballast settings, and there is *NO WAY* you could do those calculations in your head. But the resulting simple indication.. "ARRIVAL HEIGHT" is invaluable to a glider pilot and you could not possibly fly a competition without it. At first you just take the reading, add in a margin, and pray you arrive on schedule. With more experience you get to appreciate the way the reading might gradually get more optimistic as you progress, or learn to recognise the signs that suggest you should be more conservative even though the instrument is telling you it is confident. In competitions, with a reasonable Cumulus day, pilots will set off on final glide from 30 miles out with the instrument giving a *negative* arrival height, knowing they have to dolphin through a few thermals on the way to actually arrive above the airfield. En route the AH reading will gradually improve (watch it improve a couple of hundred feet with each pull-up in a thermal) until you've finally made it. So what does the Arrival Height reading actually do? I know about its accuracy and all that... Just what does it actually represent? Also, I really seem to struggle finding Thermals. But very rarely do I actually get a decent Thermal. Also, is it possible to circle and loiter in Ridge Lift? I'm no expert but, load a flight plan and take a look at the reading on the C4. If it shows that from where you are to your next waypoint -5673ft then you know you have to climb above that height to safely arrive at that waypoint above ground level and not smashing into the ground. Join the club, it's the whole idea of hunting around to find a good one. What's the point of having it to simple? Yes but it would also depend on what exactly you want out of it? The choice is an individual one I would assume. I love a challenge. But the point I was trying to make is, is that it isn't a challenge, it was becoming tedious. Purely because I hopped across 10 "Thermals" and the Variometer didn't react much at all. sun in the north (you're in australia) wind from north, too. the thermal is leaned with the wind, on top is the cloud and the shadow of the cloud is leaned with the sund wich comes from the direction of the wind. You have a triangle here. Thermal "startpoint" / cloud \ shadow. At 0 wind the thermal should be vertical below the cloud. Such a thermal is not big, you have to circle in it and center it to get the best lift. Fly at minimum sink speed plus safety margin at a bank of normally 30-45 degrees. But first you must define, what "good" thermals are! If you expect a rocket like upsucking you're wrong. Thermal strength is highly depending on wheather and location. Where I fly, thermals with 200-500ft/min are normal, 700ft/min are rather good, and 1000ft/min outstanding. It is not recommend to fly against a mountain normally. Of course you can circle there, but why? Flying straight is much more efficient, so fly straight along the ridghe until the lift ends, turn around and fly back and gain more altitude. Remember; If the slope is right, turn left, if the slope is left, turn right. So turn always into the wind and not towards the mountain, you are faster crashed than you can look. Okay - So basically the Thermal isn't necesarily under the Cloud - It will lean as per wind. Also, I don't wuite understand what you're saying about the mountain flying. Is it that if the wind is blwoing against the south side of the mountain, you'd always want to turn INTO the wind or something? What Joachim is saying is - Your flying South to North with the wind coming from your Left side with the ridge on your Right. Say the Ridge is 15nm long therefore, as you fly along hopefully you will be climbing. At the end of the ridge you turn Left 180 degrees into the Wind (therefore, alleviating the risk of hitting the side of the Ridge)to fly back down it and hopefully gain or maintain your height. re Arrival Height - it is simply the altitude MSL you will be over the next waypoint, assuming you did a straight glide there. (Using round figures...) if a Discus needs say 1,500 feet to glide 10 nautical miles in still air, and you are at 5000 feet with GPSNAV (or C4) telling you that you have 10nm to go to the next waypoint, then you'd expect the Arrival Height to be around 3,500 feet. The C4 is using various parameters to estimate your glideslope, and, given your known current height and known distance-to-waypoint, it is then basic trigonometry to calculate height-at-waypoint (aka arrival height). If you're unsure about this, try a final glide in still air and watch the AH figure on the C4. As you fly more you will find lots of things radically affect the Arrival Height figure. A tailwind will transform a crappy glider into one with world championship performance, and a headwind the opposite. Flying too fast will cause you to fly below the planned glideslope and the forecast arrival height will decay as you move forwards. Being conservative and flying slowly will typically cause the arrival height to increase, unless there's a headwind. Re thermals - your patience is unlikely to extend to thermalling for a while, is my informed guess. You will be better off setting a NW wind and flying along any of the ridges in Pennsylvania so you have some cross-country miles under your wings and turn in a thermal if you happen to fly under one along the ridge. Is it possible to use CumulusX on Vatsim? I have tried, but only "AutoThermals" work. Nothing else works on Vatsim. Yes you can. Works for me and countless others within the UK Virtual Gliding Club. If you use FSInn click on the CAVOK button which disables VATSIM's weather, setup CumulusX as you want it and away you go. Ensure that you disable FSX/ThermalDescriptions.xml to something else. Yes I've disabled the FSX Thermal Engine (ThermalDescriptions) properly - How do I disable Vatsim weather through Squawkbox? And also, won't the controllers ATIS and wind readings be messed up if I change the weather? 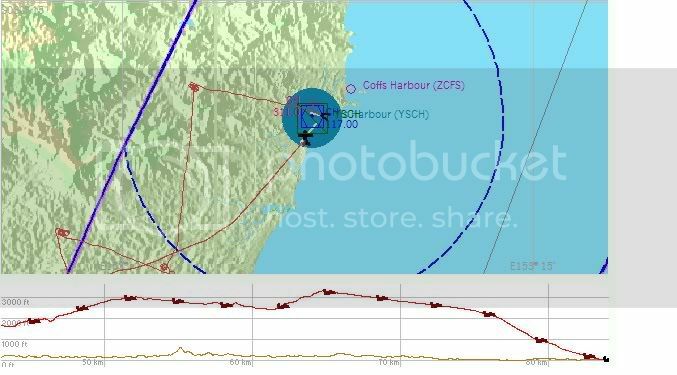 I've just done another practice flight around Coffs Harbour YSCH. I think it went well, I got at least three good Thermals. Please note, I was released from the Winch at 2,750ft . From thereon, absolutely no further power of any kind was added (no tow, no assistance... Just Thermals). Also note, around the 65KM point the decent was done on purpose, as I had turned towards Coffs Harbour and begun my final glide. Another thing to point out is, is that the above map only starts at 40KM. I had actually gained 2,000ft from a Thermal previously, but unfortunately it wasn't included on the above map profile. One note: The flowen distance seems to be very messy in FSX. I guess from looking at the screen you have maybe 20km or something flowen. 4. Fly and log a flight. 5. Load this flight (IGC format) into SeeYou and click "optimize"
The programm automaticly optimizes your flight and tells you the flowen distance. It is a serious programm for glider competitions, so it is rather expensive, but the testversion works 30 days. There are some freewaresolutions also. How do I disable Vatsim weather through Squawkbox? Not sure but there must be a tab of sorts to allow you to disable vatsim's weather. No, just place REMOCAS within the flight plan's remarks column. I tend to put as the flight plan "No set route/remocas" rather than the waypoints, although I will be following the flight plan but not along the solid route line.